Operating System: Windows XP and newer. This program will not run on earlier versions of Windows. You can insert the case information and the math will be calculated for you and print out the form. If you wish to save and send forms in Adobe format then you should purchase the Adobe Approval program. This procedure is not within our control. 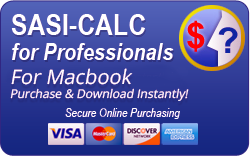 If you want to send the PDF form to your client or expand fully for editing then go to your c:/sasi-calc4XX directory and click the form you need. If your form prints out in blank, you should go to the top task bar and select file and from drop down menu select Preview. You will see a yellow lightning bolt icon. Click the icon to refresh screen. You will then be asked to "refresh report data? ", select " OK". You then can print the form with your information. Welcome to SASI-CALC, an intuitive computer program for the calculation of state specific child support guideline payments for Windows operating systems. To use SASI-CALC properly, you must enter the required data for the plaintiff and defendant. As you tab to each field and make an entry the program will continuously recalculate the recommended child support obligation. You will notice a floating "Calc " button that will assist you in converting the appropriate income or expense based upon individual receipt/payment method. If there are any additional comments you wish to have included in the printout for the court to see, you should select the comments button at the bottom right of the main screen. You may also use standard word processing programs to cut and paste you comments into "comments" box. If you have the Professional of Enterprise version you should save your entries to a file. This can be accomplished either through the use of the save button on the upper left of the main window, or by selecting the file drop down menu off the title bar, and then the “save” or “save as” options. The personal version of SASI-CALC does not have the Save feature. Finally, you should print your data. by selecting the “print” button on the upper left hand area of the title bar; or by selecting “print” from the file drop down menu off the title bar. You may view your work before printing by selecting the file drop down menu and selecting "preview ";You may choose to print from the preview window or print form the drop down title bar. If you are uncertain what the fields in the program expect you to fill in, refer to this glossary for a better understanding. Case Number: This is the case number assigned by the Court for your proceeding. If supplied, this information will print out on the final computation printout. If you do not yet have a case number in a Court you may skip this entry. Court: Choose the county where you plan to bring the cause of action. By clicking the down arrow on the right of the field you can view a drop down menu and select the applicable county in your state. This is not a critical entry in determining guideline computations. Plaintiff: The party bringing the cause of action to the court. Defendant: The party against whom the cause of action is being brought. Number of Children: The number of children under the age of eighteen years for whom support payments are being sought. ONLY INCLUDE MINOR CHILDREN. Indicate the number of children, their legal names, and their birth dates. Shared Custody: Shared custody is generally where one of the parents has the child(ren) more than 128 nights per year, but less than 236 nights. 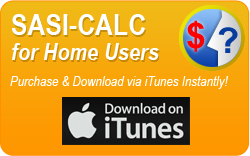 You can change the number of nights and the SASI-CALC will calculate the appropriate support number. Sole Custody: Sole custody is where one has been granted primary custody of the minor child(ren) and the other party has less than 128 nights visitation. Monthly Income: The gross amount of money earned, before taxes, including regular over-time and part-time pay, per month. If the pay period is not a monthly pay period, press the “Calc” button adjacent to the field to pop up the monthly calculator, which will convert various common pay periods to a monthly amount. Pre-existing child support: If child support payments are already being made by one or both parties, the amount should be entered in these fields. Health Insurance: This is the amount that one or both of the parties pays in health insurance premiums for the child(ren). Usually it is the difference between the total monthly premium payment for a family and the total monthly premium for a single person. Alimony Paid: Enter the amount of money that one or both parties is paying in alimony to a person from a prior marriage. Alimony Paid In This Case: Enter the amount of money the Court has ordered that one of the parties in this cause of action pay the other in alimony. Child Care: Enter the amount of money paid to provide daycare or similar custodial care to provide supervision of a minor child(ren). This can also include live-in care under certain circumstances. In shared custody cases insert each parties contribution. There may also be circumstances where the non-custodial parent is paying for child care and SASI-CALC will take this into consideration when entered. Extraordinary Medical expenses: This is where the child(ren) has unusual physical, psychiatric, dental or similar extraordinary medical expenses. This should be broken down into a monthly figure. Additional expenses: Enter monthly amount paid for a special tutoring, private instruction (i.e. dance or music lessons), private schooling, etc. Information about additional expenses should be explained in the comments field. Recommended payment: This field displays the payment calculation performed by the SASI-CALC program. This field will display the correct payment recommendation after the calculate button is clicked on the main form. This field is not a user modifiable field. The calculator is provided to accurately commute the monthly payment, regardless of how the individual is paid. Preparer: Person preparing this child support calculation, depending on the version of SASI-CALC being used, would be entered here. Comments: This field is available for the addition of comments for the court that will appear on the printout of the SASI-CALC recommendation, available when the print button on the main form is clicked. If you have entered income greater than $10,000 combined income per month the current statute does not address the required level of child support and is subject to the discretion of the court. The program has extrapolated at the same percentages of child support applied to the highest level of income covered by the statute and applied this percentage to the income in excess of $10,000.00. 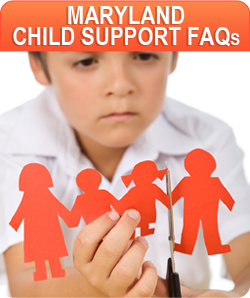 There are numerous alternatives for calculating child support on income in excess of the guidelines. This program has adopted one of the most commonly accepted methods. You should consider all options or variations in the light most favorable to your position.